Approximately 18 million pregnant women and families can benefit from home visiting nationally, but there are not enough resources to serve everyone, and it is not clear if all participants would benefit equally. Our first Data in Action brief delves into measures of need to help readers identify families and communities with much to gain from home visiting services. Using national data from the Data Supplement to the 2017 Home Visiting Yearbook, we provide suggestions that use individual indicators and a composite index to look at need across states. Readers will also discover a framework for measuring need in their own communities, including a list of potential data sources available at county and other substate levels. Suggested citation: Adelstein, S., Runes, C., & Isaacs, J. B. (2018, July). 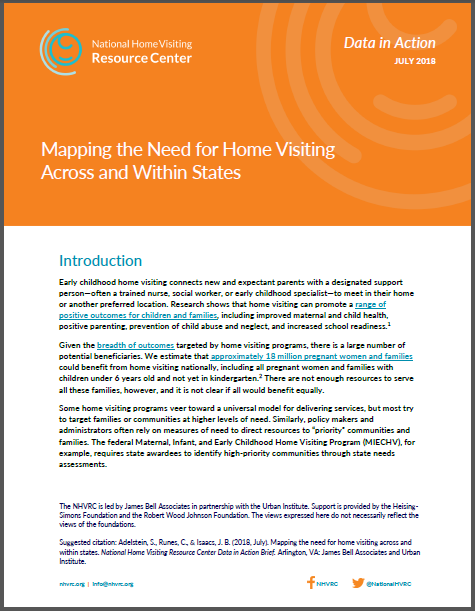 Mapping the need for home visiting across and within states. National Home Visiting Resource Center Data in Action Brief. Arlington, VA: James Bell Associates and Urban Institute.